Can there ever be enough versions of a classic? This Lemon Artichoke Dip recipe is a light and bright spin on the typical party favorite. Winter, spring, summer or fall, this Lemon Artichoke Dip recipe is always in season. 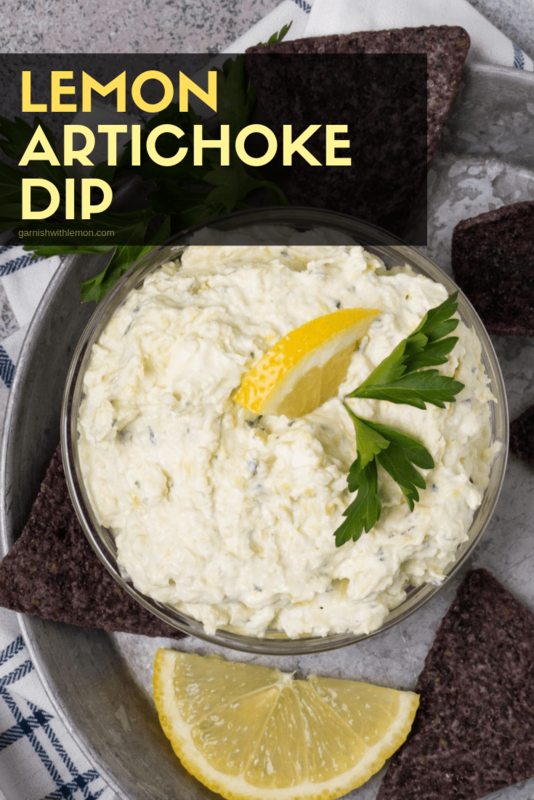 There are some recipes that are always served at a party, and artichoke dip is definitely at the top of that list. So when one of my friends made this light and bright version of it for a gathering at my house, I knew it was something I was going to recreate ASAP. 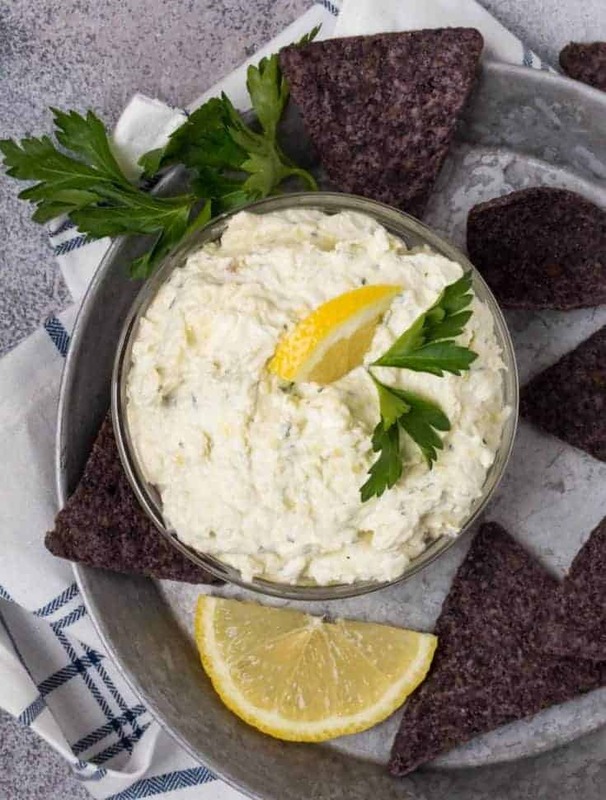 All you need is a handful of ingredients and a food processor, and you can have this Lemon Artichoke Dip recipe as one of your go-to appetizers, too. Generally, when I think of artichoke dip, I think of warm and cheesy favorites like this Asiago Dip or this Hot Crab and Cheesy Artichoke Dip. But this dip is served cold. Yup, you read that right. Cold artichoke dip. And it is spectacular. Once you dive into it, I know you are going to be addicted just like I am. I mean, how can you go wrong when you have a smooth and creamy dip like this? Especially when it has the bright citrus flavor that complements any appetizer spread and has a short ingredient list that is easy to have on hand. What makes this artichoke dip different from others? 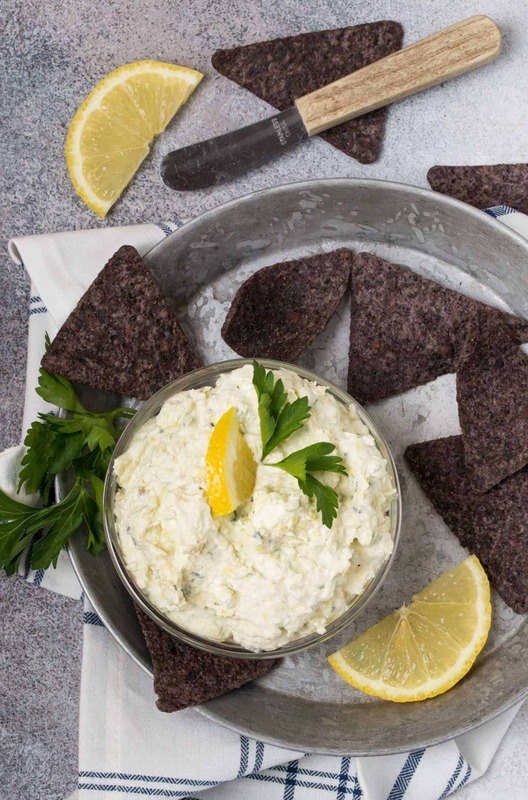 Lemon, garlic, parsley, and artichokes pack this dip with flavor. Stir in some softened cream cheese and you’re done. The sky is the limit with what you choose to serve this dip with. I love the crunch of blue corn chips, and it’s also pretty fabulous on a slice of warm-from-the-oven French bread. And when I’m feeling really healthy, I’ll scoop it up with some pea pods. However you choose to serve it, you have yourself a new appetizer that is guaranteed to become a crowd favorite. What are you waiting for? Looking for some more appetizers to round out your party spread? Here are some of our go-to favorites! This fresh take on a classic will brighten your appetizer table! Drain the artichoke hearts well and place in the bowl of a food processor. Add the parmesan, lemon juice, lemon zest, garlic, and parsley. Pulse in food processor until smooth paste forms, but bits of parsley are still visible. Place in a medium bowl and stir in softened cream cheese. Season to taste with salt and pepper. This freezes well. Simply make a double batch of the first 6 ingredients and freeze half in a freezer safe bag. When ready to serve, simply thaw and stir in softened cream cheese.